Whoa, it has been a loooong time since I posted last. I'm not even going to go back and look at when my last post was done. It will be depressing. So, I thought what better way to start back to blogging (regularly I hope) than a Small Success post with the ladies over at CatholicMom.com. 1) Despite the fact that most of the days this week have had 30+mph wind, the boys and I managed to get out and walk or play around the yard all but one day. This is a pretty big success to me as when it is that windy, I kind of just want to stay inside and cuddle up in a blanket. It was very windy and it was a very rough ride! 3) I managed to shampoo the living room with our Kirby this week. It isn't meant for deep cleaning but it does look better. Jason even got a chance to see the house clean for once. It seems like even on days that I clean the house, it's a mess again by the time he gets home. Cool bike, I want one! We had a Kirby for 15 years and really liked it, but it finally died. We couldn't afford to replace it with another Kirby. Yay for clean carpets! What a COOL bike set up! I need to get out and at least take walks with the kids. Thanks for the inspiration! What an amazing bike! 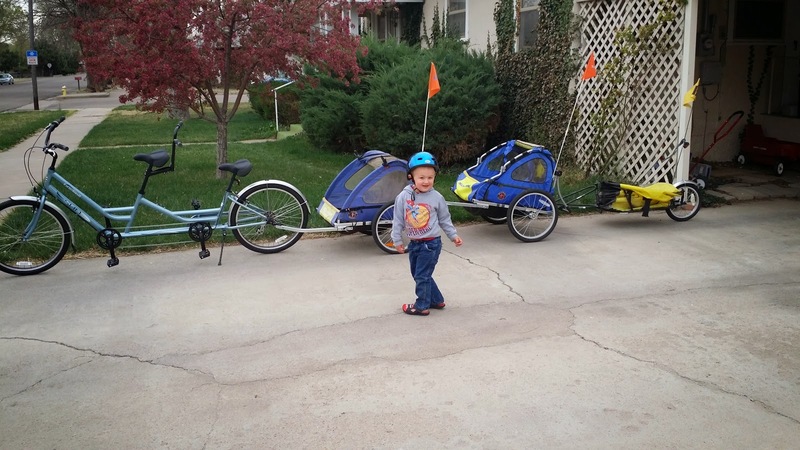 How do the kids like riding in the trailers?